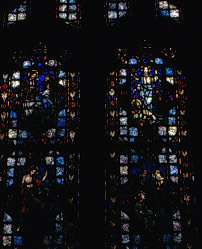 Brief Description of Subject: This window depicts the Resurrection and Glorification of Christ. On the left-upper is the Resurrection and the left-lower are the 3 Marys at the Tomb. On the right-upper is Christ at Emmaus and the right-lower is Christ and St. Thomas. The windows background is white with vitreous and antique with an ornamental border.